Created by prolific Sega game designer Yu Suzuki, Space Harrier II was one of six Sega Genesis launch titles, and was a port of a popular arcade title of the day. The game is a rail shooter and feels like a combination of 3D Worldrunner (NES) and Panzer Dragoon (Sega Saturn). Your job is to eliminate as many enemies as possible for high score, while simultaneously avoiding both them and the stationary objects in your path. 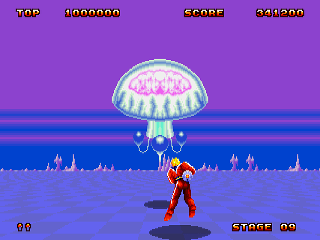 Each of the 12 uniquely-themed stages culminates in an end boss and you can choose to begin with whatever stage you like, although the game automatically progresses through subsequent levels. Space Harrier II’s colorful, vivid graphics and smooth scrolling really make it stand out from the crowd, and the tight, responsive controls make it a joy to play. The music is about what you would expect from a game of this age, and although the digitized speech is quite clear, the sound effects are sub-par. Out of the 6 Genesis launch titles, Space Harrier II is the only other game (aside from Altered Beast) that I think would have been excellent as the pack-in, as its addictive arcade action has near universal appeal and its audiovisual prowess showed just how much more advanced the Genesis was than either the NES or the Master System. Still, I would have been much more likely to buy this game being given Altered Beast, than I would have been to buy Altered Beast having been given this game. While it may look dated compared to later Genesis releases, Space Harrier II is still a fun game that’s absolutely worth owning. Buy Space Harrier II on GameGavel or Amazon. Tagged genesis, Rail Shooter, Review, sega, Space Harrier II. Bookmark the permalink.